unit was originally formed from Field Artillery personnel. The 26th Cavalry was formed in 1922, at Fort Stotsenburg, Pampanga Philippines from elements of the 25th Field Artillery Regiment and the 43d Infantry Regiment (PS). The regiment was based there, with the exception of Troop F (which was based at Nichols Field). In addition to horse mounted troops, the regiment had an HQ Troop, a Machine Gun Troop, a platoon of six Indiana White M1 Scout Cars and trucks for transporting service elements. Scout Cars of the 26th Cavalry (PS), 1937. On November 30th 1941, the Regiment had 787 Filipino Enlisted Men and 55 American Officers. For the rosters of the 26th Cavalry Regt., please click here. After the Japanese invasion on December 8, 1941, the 26th participated in the Allied withdrawal to the Bataan Peninsula. In doing so, the unit conducted a classic delaying action that allowed other, less mobile, units to safely withdraw to the peninsula. During the delaying action the 26th provided the "stoutest and only" serious opposition of the withdrawal. In the initial landings of the Japanese Imperial Army invasion, the Regiment alone delayed the advance of four enemy infantry regiments for six hours at Damortis, a town in the Lingayen Gulf, and on December 24 repulsed a tank assault at the town of Binalonan, Pangasinan. However, the resistance was not without cost, as by the end of that day, the Regiment had been reduced down to 450 men. Colorized photo of Capt. John Wheeler's troopers. Photo appeared in Life Magazine in 1941. Colorized by Sean Conejos. Following these events, the Regiment was pulled off the line and brought back up to a strength of 657 men, who in January 1942 held open the roadways to the Bataan Peninsula allowing other units to prepare for their stand there. 26th Cavalrymen pass an M3 tank, December 1941. 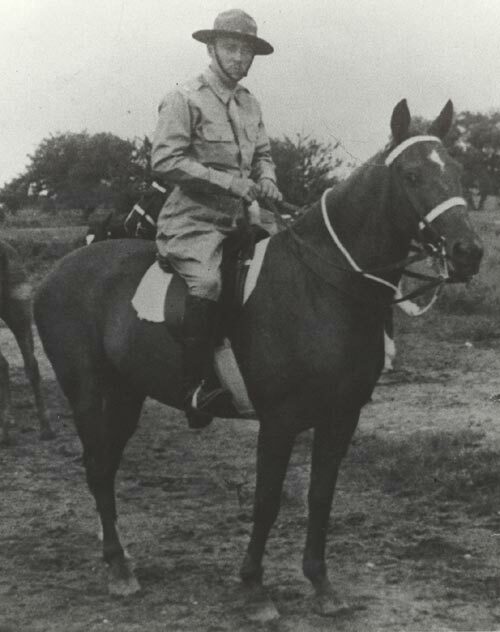 On Bataan, a 26th Cavalry Troop, consisting mostly of Filipino Troopers and led by Lt. Edwin Ramsey performed the last U.S. Cavalry horse mounted charge to engage an enemy in warfare. This charge occurred at the town of Morong, Bataan on January 16, 1942. Lt. Edwin Ramsey on Brynn Awryn prior to the beginning of WWII. He led the last wartime U.S. Cavalry charge. Col. Edwin Ramsey recounts how the Last Cavalry Charge came about. Following this, due to a shortage of food, their mounts were butchered and the regiment was converted into two squadrons, one a motorized rifle squadron, the other a mechanized squadron utilizing the remaining scout cars and Bren carriers. Other actions of the 26th Cavalry are; Following the delaying action down the central Luzon plain, 26th Cavalry Troop C was cut off from the rest of the Regiment, having been ordered into Northern Luzon in an attempt to defend Baguio by Major General Wainwright in late December 1941. In January 1942, the unit, with assistance from 71st Infantry and elements of the 11th Infantry raided Tuguegarao Airfield, destroying several planes and causing enemy casualties. Eventually the unit was supplemented by other soldiers and guerrillas, and remained an effective fighting force well into 1943. The remnants of Troop C would later be integrated into the United States Army Forces in the Philippines-Northern Luzon. Other guerrilla organizations were led by Officers of the regiment like Lt. Edwin Ramsey who ignored the surrender orders (and other Filipino enlisted men) who escaped from Bataan to form a substantial guerrilla resistance force against the Japanese Imperial Army. Philippine Scouts. His father and uncle served with the 26th.